Glory, gain, riches, triumph, pleasure, frankness, truth, shamelessness, arrogance, vanity, manifestation, recovery from sickness, but sometimes sudden death. Composites, the head, apex, prince of heaven. Hieroglyph, a radiant SUN and two naked children, taking hands in a fortified enclosure. 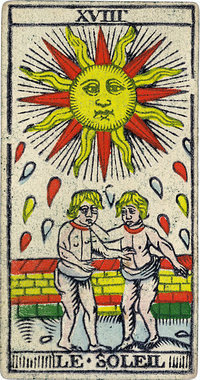 Other Tarots substitute a spinner unwinding destinies, and yet others a naked child mounted on a white horse and displaying a scarlet standard. Selection of Christian Gods (10); Apostles (12); Evangelists (4) and Churches of Asia (7). English equivalent of Col. LI. Numerical Value of Col. CLXXV. The Lord of the Fire of the World.